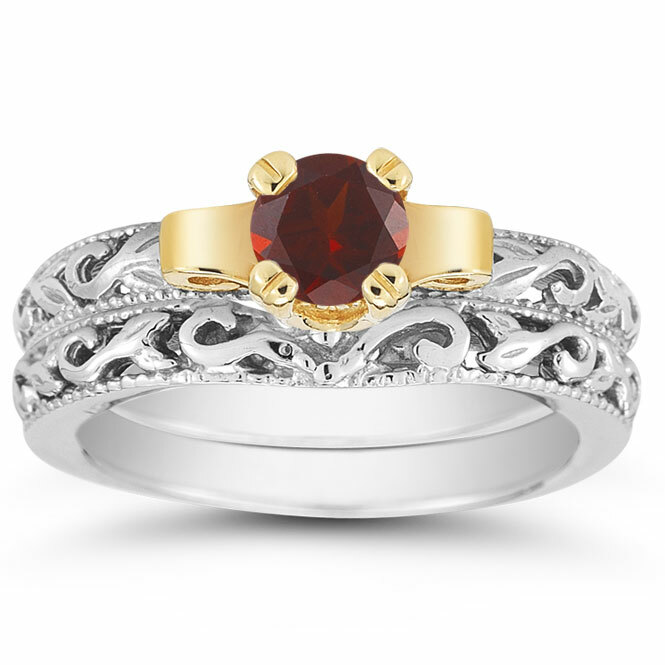 A rich red takes center stage in this exquisite ring set from Apples of Gold jewelry collection. 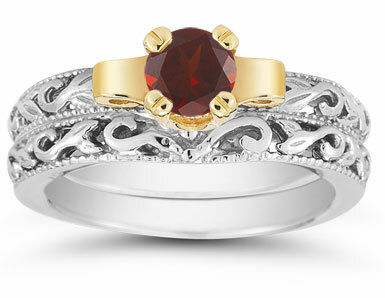 The 5mm garnet gemstone casts a luxurious glow with its intensely scarlet hue. The garnet is mounted in a striking yellow gold which offers a soft contrast to the stone. The main attraction is supported by two equally lovely white gold bands that showcase expert craftsmanship of filigree design that are art deco in nature. The rings are polished to a high shine for a truly illuminating piece of jewelry. We guarantee our 1/2 Carat Art Deco Garnet Bridal Ring Set to be high quality, authentic jewelry, as described above.